All of us know that the Moola Brindavana of Raghavendra Swamy is in Mantralaya. The first Brindavana outside Mantralaya was constructed and consecrated by Appancacharya in Bichale which is a small village in Raichur district. However, the structure at Bichale is Ekashila Brindavana, while everywhere else it is the Mrithike Brindavana. The first Mrithike Brindavana outside Mantralaya is in Karnataka. 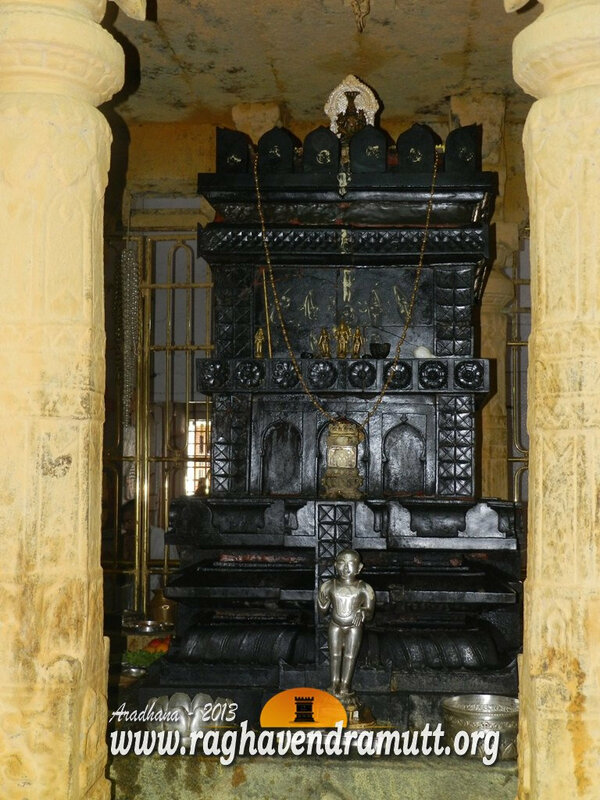 This Brindavana is in Kolar district and it was consecrated a mere ten years after Raghavendra entered Brindavana in Mantralaya in 1671. It was in 1681 that the first ever Mrithika Brindavana came up at Budhikote in Bangarpet taluk of Kolar district of Karnataka. Ironically, Budhikote is today known as the land where Hyder Ali was born. Nobody talks or even knows that a Rayara Matha exists in Budhikote. The Matha is located in Budhikote village just at the foothills of the fort. By the way, Budhikote is also known as the land of ashes. Budhikote is also home to India’s first cable community radio station. It has been operational since 2002 under the Namma Dhwani project. The Prathistapana of the Brindavana was done by the Kallyavi family which is even now in charge of the temple. This makes it the oldest Mrithika Brindavana of Raghavendra Swamy in Karnataka. Getting back to the Namma Dhwani project, it has an interesting beginning. Initially, 36 self help groups of women decided to join hands and set up a combined cable radio network, covering 750 households. The programmes for the network were produced at the Community Multimedia Centre in Budhikote. The broadcast is in chaste Kannada. Teachers and students of the school nearby the community centre take an active part in the programmes to be broadcast. The Namma Dhwani project has earned world-wide recognition and it has been adopted by UNESCO. Budhikote is just more than an hour’s drive from Bangalore. Though it is has a history dating back to the 8th century BC, Budhikote, which is just 15 kms from Bangarpet in Kolar district is a yet to be explored tourist destination. The first mention of Budhikote is in an 8th century inscription belonging to the Bana dynasty which ruled over areas around this village. The inscription says Budhikote was part of the Tekal province. Better known as the birth place of Hyder Ali, the father of Tipu Sultan, Budhikote is about 88 kms from Bangalore. It is worth a visit either for its own beauty and historic importance or part of a tour of places in Kolar district. There is a huge mound of ashes in Budhikote and it has an ancient tale to it. The ashes were collected after a mammoth yagna was conducted here, says a local legend. By the way. Budhi in Kannada means ashes and Kote is fort. So, if you translate Budhikote into Kannada, it means the “Fort of Ashes.” The ashes are remnants of the Poornahutis of yagnas performed in ancient times. The locals, therefore, called it Vibuthipura (Vibhuti is ash in Kannada). There are two routes to reach Budhikote from Bangalore. You can drive down to Bangarpet via Kolar on the old Madras Road (NH 4) or go to Malur directly from there take a deviation to Budhikote. If you take the Malur road, keep going towards the Tamil Nadu border and you come up to Budhikote set amidst picturesque surroundings. The first thing that catches your eye is the fort. The fort is in ruins and much of the structure has crumbled. However. A few of the surviving circular bastions are worth exploring. The fort was built by Hyder Ali who is believed to have spent his childhood here. The fort was once the bone of contention between the British and Hyder. Hyder’s father, Fateh Mohammad, came here from Gulbarga and was given shelter by a local Palegar or Nayaka. Fateh Mohammad’s family originally hailed from Punjab. There are two temples when you enter the fort. The temple on the left has a carved figure of Hanuman. There is a big boulder behind this temple. The temples to Sugreva and Venugopala are in ruins. The Kalyani in both the temples needs cleaning. Within the fort is a small enclosure with a stone tablet saying that this is the birthplace of Hyder Ali. Locals ay a chain was tied to a nearby boulder to anchor the cradle. As can be expected the chain is missing. This is where the cradle of Hyder was rocked by his mother. There are several boulders with holes. The chain was passed through the holes and tied to the cradle. The memorial here says Hyder was born in 1720, while historical texts and other sources say he was born in 1717. There are several inscriptions referring to Hyder Ali in the fort. Budhikote has a few temples which is a must see for visitors and pilgrims. If you leave Bangalore early, you can reach Budhikote by 8-30 a.m., and also visit the temples of Kodandarama, Somaeshwara and Venkatesha. The Someshwara and Venkatesha temples were built by the Vijayanagar Emperors. A few kms down Budhikote (4 kms away) is a big lake or reservoir called Markendeya reservoir with a Nilgiri groove adjoining it. The Markendaya river flows into the tank. The lake is rarely visited and you can enjoy calm and quiet here. It is called the KRS of Kolar. The reservoir was constructed between 1936 and 1940 and it then cost Rs. 4 lakhs. Take in the sunset here and it is breathtaking. Check out the Government fish farm which is nearby. This is the place where a majority of the fish breeders and sellers of aquarium source their fishes. There are about 50 ponds here where a variety of “ornamental” fishes are bred. Budhikote is not for people who enjoy crowds. There are many places of interest in and around Budhikote which are unexplored. The huge rocks, boulders and hillocks in and around Malur, Budhikote make for an interesting day for a rock climber. Watch out for snakes and lizards. It is better to carry water and food. Otherwise, you have to eat at Kolar or Mulabagal which is some distance away. There are buses from Bangalore to Budhikote. Kolar, Malur and Mulabagal are well connected to Budhikote by buses. In case you prefer to come by train, you can alight either at Kolar or Bangarpet and then catch a bus to Budhikote. It is eleven kms from Bangarpet. If you are in Bangalore, this can be a day’s trip. For those interested in literature, here is a small anecdote. The English writer E M James came to Bangalore in 1927. He visited Budhikote during his travels to KGF and wrote about it. He has immortalized Budhikote in his verse called “Poems of South India, .” Two others works of his which have reference to Budhikote are the Old Fort of Budhikote and Indian Landscape.